TWU Health Studies: 37th Annual Great American Smokeout! dying from chronic obstructive lung diseases (such as chronic bronchitis and emphysema) by 12 to 13 times (CDC Fact Sheet). Smoking may also cause cancer in parts of the body other than the lungs, and there are reproductive and early childhood effects - such as infertility, stillbirth, and sudden infant death syndrome - that are linked to smoking. So, stopping now - or not starting! - is one of the best health choices that you can make for yourself. In addition to significantly impacting an individual's health, tobacco also has a drastic affect on individual's - and society's - wallets! This helpful infographic shows the true cash impact of tobacco on healthcare costs, productivity, and other aspects of daily life: Tobacco - The True Cost of Smoking. Once started, smoking can be a very difficult habit to quit! 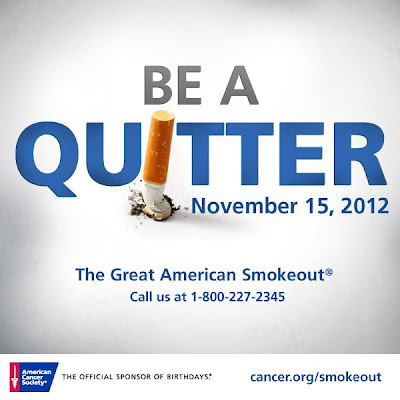 The American Cancer Society realizes this, so the home page for the Great American Smokeout has a variety of helpful information, including steps you can take to quit, a guide to quitting, a list of the numerous health benefits to be gained from quitting, and desktop helpers to provide you with motivation: The Great American Smokeout. I encourage you to make a healthy decision for yourself today and "be a quitter"!